When Uttar Pradesh boy was drafted into the playing eleven ahead of much acclaimed bowlers, many were surprised. More so, when Indian skipper Mahendra Singh Dhoni gave him the ball the Indian attack, ahead of Ishant Sharma and Ashok Dinda. But this was just the beginning. He struck in the very first over by penetrating the defence of Pakistani opener Nasir Jamshed (2). In the second ball of his second over, he caused more damage by forcing Ahmed Shehzad (5) to play a shot, who nicked the ball and Dhoni caught it safely. In the same over he uprooted the middle stump of Umar Akmal (0). He brought hope to the Indian camp and Pakistan began to play him cautiously. When he finished his spell, it looked not only economical, but also quite impressive for a debutant. 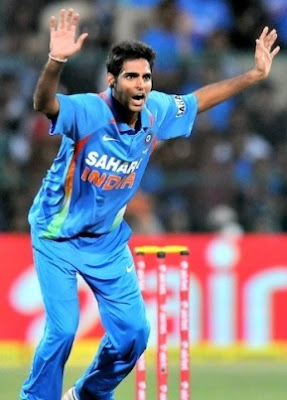 He ended with 3 wickets conceding a paltry 9 runs from 4 overs. His performance certainly makes him the most valuable player of the day for India.